Back to Basics - Liz de Nesnera. Best of Both Worlds VO. I’ve been in the voiceover industry for over two decades. I’m in my 14th year of being a full-time voiceover talent. I love what I do. And I am lucky enough to have built a business that has allowed me to keep a fine roof over my head, in a place I love to live, to keep food on the table and my awesome stick-shift-AWD-Subaru Forester (named Whitaker…think about it 😉 ) in the driveway. I’ve trained in voiceover technique with some of the best in the business, and I run my business AS a business. Sometimes things happen that make you stop and think. This year, the “things” were that two of my best clients decided to change direction when it came to their voiceover needs. One was bought by another company which had their own roster of talent, and another has changed the way they record their projects. Now, remember when I said above that I run my business AS a business? Good thing! Years ago, a friend of mine, and a very successful VO in his own right asked me this question: “If your two best clients decided to go elsewhere, would your business survive?” I never forgot that question, and today I can say without a doubt: ABSOLUTELY! In fact over the last 10 years, at the end of every year, I run my reports and REMOVE the revenue from that year’s top two clients to see where I would be had I not gotten that income. You should try it, it’s in interesting exercise. 🙂 How top heavy are you with your top two clients? Do they make up 10% of your income? 30%? 50%? Ask yourself: “If my two best clients decided to go elsewhere, would my business survive?” Would you still be able to pay your bills and put food on the table? So with that in mind, and while my business is still thriving, I decided to go back to basics. I signed up for a 6-week marketing course. I just finished Week-1. Wow. What an eye-opener! I’m diving deep and committed to expanding and finding my next new two-three-four-five best clients. How about you? 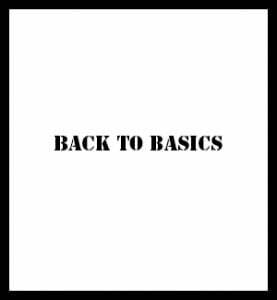 Do you need to get back to basics? Whatever that means to you, it might just be what leads you to your next success.